Why are my Adwords CPC going up, leads going down, and position getting worse? This question has come from a few business owners who outsource their Google Adwords management and are wondering why their average cost-per-click (CPC) has jumped from $3 to $6 or $9. Why are my Google Adwords CPC going up? At first we got a lot of leads but now it’s dropping off, why? We used to be in the Top 3 paid spots for <favorite search term> but we weren’t yesterday. Why? Is there something my SEM expert can be doing to improve all of this? These actually seem like a quite broad range of questions but, in fact, they are all related. Overview of how Google decides which ads to show. Google Adwords is an auction market… But it’s not a PURE auction where the highest bidder wins. You see Google is in business to generate revenue so they take a bit longer term approach to their auction. Let’s look at a very OVERSIMPLIFIED example. WaterMan and WaterBoy are 2 different businesses that are bidding on the keyword “water filters”. WaterMan is well established and decides to bid $4/click. WaterBoy is just getting started and decides he can only afford $2.01/click. So which ad does Google show on top??? We don’t have enough information yet… You see, WaterBoy understands how Google works and realizes that if he invests a bit more effort in his ads, he can actually get better placement than WaterMan. So he creates a Highly Relevant ad that 4% of Google Searchers click on for a 4% Click-Thru-Rate (CTR). WaterMan doesn’t have time to be bothered with all that, puts together a basic ad and so ends up with a 2% CTR. So let’s do the math for Google to see which advertiser will make Google more money. If Google shows WaterBoy’s ad 100 times, 4 people click on it at $2.01/click for total revenue of $8.04. If Google shows WaterMan’s ad 100 times, 2 people click on it at $4/click for total revenue of $8.00. In other words, Google can make more money showing an ad with a LOWER bid price. Again, this is a vast oversimplification, but this helps us answer our first question. Your competition is creating ads that are more relevant (i.e. have a higher CTR) than yours or new competitors have recently entered the market resulting in more people bidding on the same words. WaterBoy started his marketing at the beginning of the year on January 1 however WaterMan is a bit slow to get on board with new technologies and didn’t get started until June 1st. So when WaterMan’s ads start running, Google doesn’t yet know if his ads are any good because there is no history. So Google gives the new guy on the block, WaterMan, top placements for his ads until Google has enough data to do the calculations above. Google at first gave you the benefit of the doubt and top positions however, over time your competition developed more relevant ads that get more clicks and therefore make Google more money. We used to always be in the Top 3 paid results for <my favorite search term> but we weren’t yesterday. Why? Your ad became less relevant compared to your competition. You competition is now willing to bid more. More competitors have entered the market to bid on the same keywords. Keep in mind, not being in the top 3 isn’t always a bad thing and is pretty much impossible to guarantee unless you are just willing to drastically over-bid everyone else. Sometimes it’s just not cost effective to pay $10/click to get top position. Here’s the thing, we hired a new team member to help with copy writing, marketing, and Google Adwords. She’s been with us for about 7 weeks, has received regular training, and is probably 50% up to speed on Adwords. Of everything we do, Search Engine Marketing is the most complicated and fastest-changing. Granted, we’re fanatical about being the most knowledgeable around in our given area of expertise so our training and our definition of “expert” status might be a bit higher standard than most. Set Benchmarks – The most important is your cost/contact or Cost Per Acquisition (CPA). Know if it should be $10 or $500 by knowing the lifetime value of your customers. The lifetime value can vary significantly for residential, commercial, and industrial clients and so should your CPA. Become obsessed with testing – We’ve done tests where a single word in the headline of a Google ad can change the click-thru-rate nearly 300%. If our CTR is going up 300% your CPC is going down but the only way to know which word is going to make that difference is to test. Adjust your individual keyword bids – This concept is pretty simple but rarely done in small business because it can be time intensive. The idea is that if “water filter” has a CPA of $100 and “water testing” has a CPA of $25 and your target CPA is $50 then you need to cut your “water filter” bid in half and you can afford to increase your bid on “water testing” by double. All words are not created equal and the best words vary from one locality to another. Even though there are dozens of other things you can do to improve SEM, keep your CPC down, and get more leads, these 4 things are important enough that if your current SEM expert was just doing those, your CPC wouldn’t be going up. If you don’t want to be an Adwords expert, how do you know if your hired expert is doing his job? If your cost-per-click is going up, your leads are not, and you didn’t have an influx of new competition in your market, then your SEM expert isn’t doing his job and you should replace him or her. As a small business owner or marketer, keeping up with all the changes in online marketing, SEO, SEM, PPC, and social media can be a daunting task. However if you focus on the most important parts, and hire an expert for the rest, it’s actually pretty straight-forward. Be wary of anyone who says we don’t know how SEO works or it’s just too complicated to explain. Firstly, SEO stands for Search Engine Optimization and is also referred to as Organic or Free search. These organic search results show up in the center of the Google Search Engine Results Page (SERP). In the graphic on the right, the SEO results are highlighted in blue. The Paid ads (or Search Engine Marketing (SEM) results) are generally the top 3 on the SERP and the ads along the right-hand side of Google. In the example to the right, the Paid Ads are highlighted in red. The third type of result is a Google Places listing which is Google’s own version of an online Yellow Pages directory. Those results are highlighted in yellow. You don’t have to pay per click. Once you’ve optimized your site and got to the top of the search results, you can get a thousand clicks per day and you don’t have to pay a penny extra. Studies show only about 25% of people click on Paid Ads. Those numbers are even more skewed when you take into account the searchers level of education. Individuals with a Phd only click on paid ads 1-2% of the time so keep that in mind if your target market is highly educated. Google and other search engines are getting much better at determining the location of the web searcher and therefore assume that for a search like “plumber” you are looking for someone local and so will tailor the search results to provide you with local information. Nonetheless, the results page is still going to be much different with and without the city. Currently, about 20% of searches on Google are locally focused and that trend has been increasing over the last few years. Get in as many online directories as possible. This includes Google Places, Yahoo Local, Bing Local, Yellowpages.com, Manta.com and others. The more directories you are in, the better off you’ll be. 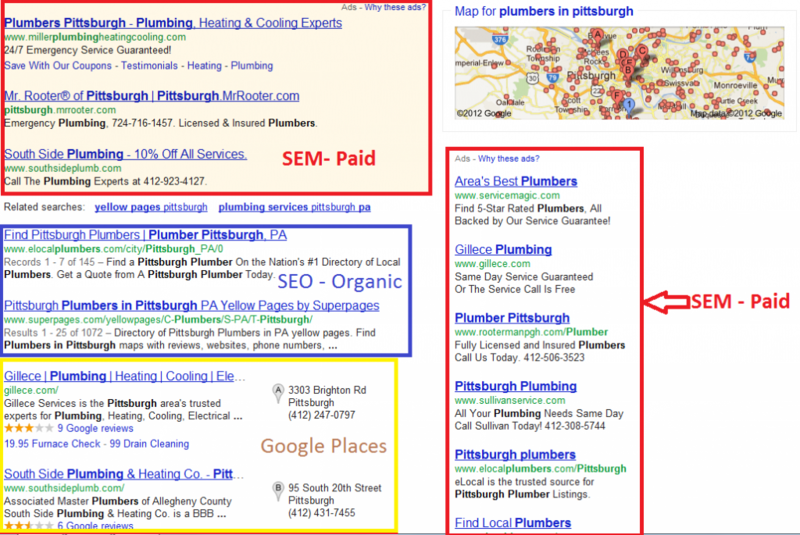 Notice in the screenshot above that both organic results (highlighted in blue) are actually for online directories eLocalPlumbers.com and SuperPages.com. Make sure that each online directory has your correct website address! This is crucial to optimizing your website for search engines. Also, make sure that you take full advantage of the “Description” section of each directory listing focusing on the keyword terms that people looking for your product or service are most likely to use. For instance our plumber wouldn’t say, “Providing plumbing services in and around Pittsburgh for homes and businesses.” Instead he would say, “Bonded and Insured expert residential and commercial plumbers providing plumbing repairs, plumbing service, emergency plumbing, new home plumbing, hot water heater installation, and fixture replacement.” See how I used keywords throughout the description that someone might be searching for? Have other people link to your page. – Are you running radio or TV ads also? Have those TV and Radio stations put a link on their website to yours. Every link to your page from another page (with a few exceptions like Twitter) is seen by Google as a vote that your page is useful. The more “votes” you have the better Google, Bing, Yahoo and other search engines will treat your site and the higher it will be listed. Focus your page titles and web page text locally. If you’re a plumber in Pittsburgh, make sure all of your pages list out the cities you serve. Generally this can be done inconspicuously in the footer of a page. Just make sure the text is visible. It’s against Google’s policies to have “hidden text” that is, for instance, white text with a white background so the visitor can’t see it. If you are buying a “pre-made” website for your industry make sure that you have the ability to add information for your local market. Also weave the names of cities into the copy on your site. A great way to do that is with a list of testimonials that include the city and state of each person providing the testimonial. Fill-in the blanks with a strong SEM campaign. Since 20% of online searches are locally focused, that means that 80% are not. So don’t ignore those 80%. Target them with SEM which is also called Pay-Per-Click (PPC) or Paid Search. Notice in the screenshot above that without scrolling down the searcher will see 2 organic results, 2 Google Places results and 9 paid results! In other words, SEM is a significant part of your online marketing plan. One of the great benefits of SEM is that you can get tons of information on what terms are most popular in your local area and then use that information to better optimize your site in step #3 and your descriptions in step #1. My recommendation for this is to work with experts like my team. In reality, to be a guru at online marketing is a lot more complicated than just 4 steps. However, like hiring a lawyer, accountant, or IT specialist, it’s beneficial to understand the basics even though you will most likely want to work with an expert in small business online lead generation. Now that you understand these 4 points, you can work on optimizing your own web presence very quickly and cheaply with a few of the suggestions above. At the very least, you now know the right questions to ask and what answers to listen for when soliciting the help of an online marketing expert. If you’re a small business owner or leader and have any questions, feel free to comment on this blog or contact me directly. This is a crucial area of your marketing plan where you are losing leads daily so don’t wait to address it!